(DVD + CD set)(DVD-AUDIO) A Bert Whyte recording of Maestro Stokowski conducting the Houston Symphony at the Houston Civic Center in 1959. Le Poeme d’extase is a big, one movement work in sonata form that combines the elements of a symphony and a tone poem. 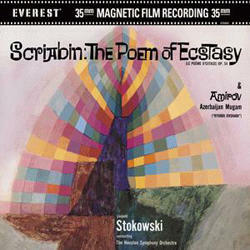 The work highlights Scriabin’s development and exploitation of new harmonic ideas including chord structures constructed on intervals of a fourth instead of a third. Coupled on this release is another Stokowski/Houston performance of Amirov’s “Azerbaijan Mugan” recorded on March 16th, 1959 at the Houston Civic Center. HDAD Plus is a 2-sided hybrid disc that will play in 24/96kHz on a standard DVD video player (no footage included) and in 24/192kHz on a DVD audio player.